The tiny Spanish island of Gran Canaria is home to a tour operator that handles college basketball team's off-season trips—and to an academy that develops prospects. Is there a link between booking tours and landing recruits? College basketball’s foreign exhibition tours were once affairs of state. In the summer of 1965 a group of Saint Joseph’s players and coaches, freshly enlisted as diplomats, posed for a photo on the stairs to an Eastern Air jet while holding a sign that read VIVA LOS HALCÓNES, which loosely translates to “Long Live the Hawks.” Decked out in matching blazers and striped ties, they were embarking on a 17-game, 32-day, 20,000-mile tour through Brazil, Uruguay and Argentina that, as coach Jack Ramsay put it after the trip, had them playing “in warm gyms, cold gyms and outdoors when the players on the bench [had to wear] overcoats.” They endured these conditions because they were emissaries of the U.S. State Department, whose People-to-People Sports Committee sponsored American team tours all over the globe during the 1960s. Off-season foreign trips are now more popular than ever—the NCAA permits Division I basketball teams to take one every four years, and 63 schools went abroad last summer—but they’re run by private companies rather than the government. Diplomacy has yielded to capitalism. Foreign tours are at least a $5 million-a-year business, and one in which approximately 90% of team trips are booked through U.S. companies specializing in athletics travel and/or staging early-season tournaments—the most prominent being Basketball Travelers, of Shoreline, Wash., and Anthony Travel, of Dallas and Ontario, Calif. But Sports Illustrated has found that since at least 2010, between 3% and 7% of this business has shifted to a company registered on a tiny island off the coast of Morocco. According to documents obtained through Freedom of Information Act requests, seven Division I programs—Louisville, Minnesota, N.C. State, Oklahoma State, Troy, UAB and UNC-Greensboro—contracted to spend $944,737 with Promosport & Tours, S.L., on Gran Canaria, a Spanish island. Four more private colleges exempt from public-records requests—Loyola Marymount, Portland, Seton Hall and Valparaiso—have also been Promosport tour clients, potentially raising its D-I business to well more than $1 million over the past six years. What did these 11 colleges have in common, aside from booking travel with an obscure Spanish company with a rudimentary website? Each school signed one or more recruits who had played at Canarias Basketball Academy, a private, amateur academy that was founded in 2007 by Rob Orellana, a former assistant coach at Cal State-Fullerton, Fairleigh Dickinson and St. Francis. Not only is Canarias Basketball Academy (CBA) registered at the same business address in Gran Canaria as Promosport & Tours, but also one of CBA’s assistant coaches and its operations director, Samuel Sosa Cruz, is listed on contracts as Promosport’s president. Promosport’s college clients added at least 19 former CBA players to their rosters over the last six seasons, and in multiple cases, colleges signed Promosport contracts or took Promosport trips within months of adding former CBA players. But of the 64 current or former D-I players that SI could identify as having passed through CBA, 25 could be linked to coaches whose teams did business at some point with Promosport. A college coach who recruited CBA players told SI, on condition of anonymity, that while there was no explicit quid pro quo, agreeing to take a Promosport tour was known to be a “technically legal” way to improve a team’s chances of landing a CBA prospect. And a former CBA coach told SI, also anonymously, that foreign tours were “one of the ways” the recruiting of CBA players was influenced. The contract for the Golden Gophers’ trip was drafted on Oct. 14, 2014, and signed the following month by then athletic director Norwood Teague and Sosa Cruz. Six months earlier Minnesota coach Richard Pitino had announced the signings of two foreign recruits to bolster his thin frontcourt. One was 6'9" Senegalese forward Gaston Diedhiou, who played the previous season at CBA. The other was 6'11" Malian center Bakary Konaté, out of Sunrise Christian Academy in Wichita, Kans. Before arriving in the U.S., Konaté played for the junior program of CB Gran Canaria, the club that once employed CBA’s Orellana as a recruiter. Konaté has started all but five games this season as a sophomore, while Diedhiou, whose admission to Minnesota was delayed until December after reported problems with an English-proficiency test, has appeared in 23 games off the bench. Minnesota declined multiple requests for comment from SI regarding Promosport. 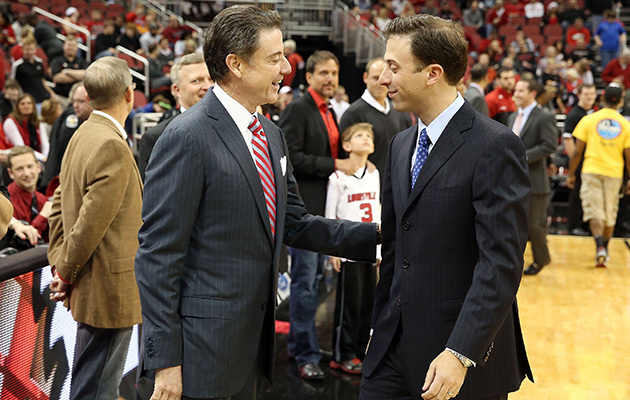 Pitino’s father, Rick, had a similar CBA-Promosport connection at Louisville. On Nov. 19, 2013, the Cardinals signed 7-foot Norwegian center Matz Stockman out of CBA in what multiple news outlets called a “surprise” addition to Louisville’s 2014 recruiting class. Five months later, on April 25, 2014, the school signed a $167,850 contract with Promosport for a minimum 30-person trip to Madrid, Zaragoza and Barcelona that was scheduled for August 2015—the first summer the Cardinals were eligible for a foreign tour after traveling to the Bahamas in ‘11. SI obtained emails between Promosport and Louisville indicating that in 2014, the school paid two installments on the tour totaling $75,000. According to Louisville spokesman Kenny Klein, the school then canceled the Spain tour on Feb. 24, 2015, in favor of internally arranging an August 2015 trip to Puerto Rico for exhibitions against the island’s junior and senior national teams—the latter of which Rick Pitino had agreed to coach in that summer’s Pan American Games and Olympic qualifying. Fifteen days after Karlis’s commitment, Seton Hall’s booster club, Pirate Blue, posted an invitation on its website for fans to “travel all-inclusive with the men’s basketball team to Spain” on Aug. 11–20, 2011. Willard did not respond to multiple requests from SI to comment on the trip, but Seton Hall associate AD Bryan Felt confirmed that the tour to Madrid and Gran Canaria, which was delayed until the following summer, was run by Promosport. De Thaey’s college career, meanwhile, did not go as well as his coach had hoped. 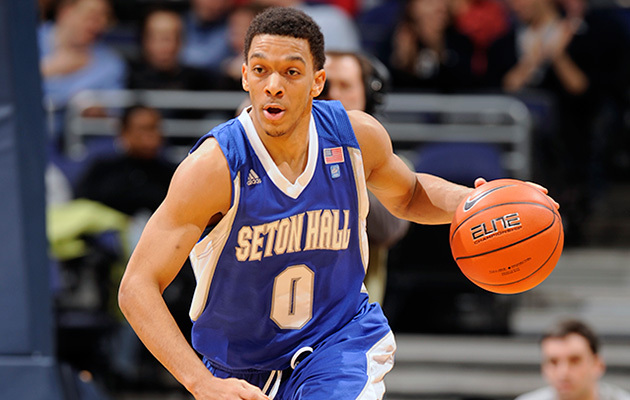 He appeared in 19 games as a freshman, averaging 1.2 points in 5.6 minutes. Five games into his sophomore season, facing dwindling playing time and dealing with an illness in his family back in Belgium, De Thaey left the school to pursue professional opportunities in Europe. This was not an anomaly; 29 of CBA’s 64 D-I products, or 45.3%, have either transferred or departed programs before their eligibility expired. Through a spokesman, Gottfried declined to discuss the CBA-Promosport connection. De Thaey says he made his recruiting decision organically after a Wolfpack coach visited CBA. “I never really felt like I got pushed to choose them,” he says. But De Thaey was also in the dark about N.C. State’s travel-spending ties to Promosport, or the existence of the company. “I’m not shocked—basketball is a business—but I’m a little surprised,” he says. At Troy, Phil Cunningham took over as coach on March 26, 2013, and three weeks later he announced the signings of his first two recruits: 6'3" guard Miguel Dicent, who played for CBA as well as the Dominican Republic’s junior national program, and 6'8" forward Jaroslav Moravek, a Slovakian national-team member who has been touted as a former CBA player on the academy’s website and now averages 2.3 points and 1.9 rebounds for the Trojans. On July 12, 2013, Troy entered into a contract with Promo Sport, S.C.P., for a minimum 16-person foreign tour to Barcelona and the Canary Islands at a cost of $76,720. The Trojans took the trip from Aug. 1 to 11, 2013. Cunningham and Troy did not respond to multiple requests for comment. Two more teams took overlapping Promosport tours to Spain in the summer of 2014. UAB, which signed a contract for a minimum 24-person, $105,576 trip with Promosport in March 2014 and traveled that August, had the most chronologically distant connection to CBA of the teams SI analyzed. In Jerod Haase’s second month on the job in 2012, he added 6'10" Bosnian transfer Fahro Alihodzic, a former CBA player whose college career began at Fordham. Haase told SI that Alihodzic, who became a two-year starter for the Blazers, was recruited strictly through the player and his parents, not CBA. Loyola Marymount, meanwhile, went on its exhibition tour to Madrid and Barcelona on Aug. 11–22, 2014, and Maria Behm, a senior associate AD at the school, confirmed that the trip was through Promosport. Mike Dunlap had been hired as LMU’s new coach five months before the departure date, and he had quickly set about assembling a six-man recruiting class, with two players coming from CBA. 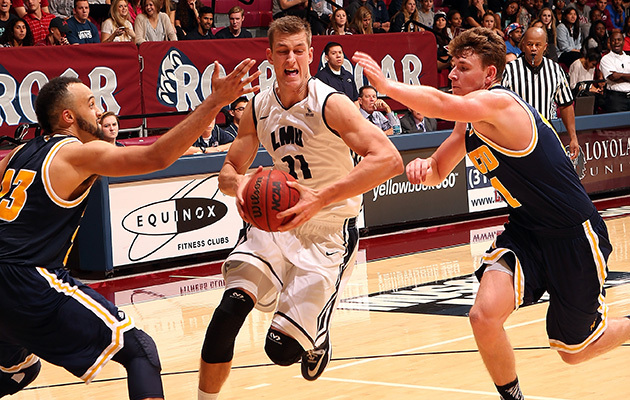 Simon Krajcovic, a 6'3" Slovakian national-team point guard, signed with LMU on May 6, 2014; and Petr Herman, a 6'10" Czech power forward, signed on May 28, 2014. Dunlap did not respond to multiple requests for comment. Herman averaged 3.7 points and 2.8 rebounds as a sophomore backup this season, while Krajcovic’s stint at LMU was abbreviated. He says that in a meeting following a freshman year in which he started eight games but was sidelined for February and March with a knee injury, Dunlap told him “that he wouldn’t be getting as much playing time in the future, and it would be good to look somewhere else.” Krajcovic, like many CBA players before him, transferred, and is now at the (junior) College of the Sequoias in Visalia, Calif. When Oklahoma State and Valparaiso, two schools that had never taken a foreign tour, decided to do so, they had one thing in common: a surprise, recent addition of a former CBA big man. On June 30, 2012, the Cowboys announced they would be taking a trip to Barcelona and the Canary Islands that August. An Oklahoma State men’s basketball expenditure journal from 2012 states that the school paid $120,300 to “Promo Sport” on July 1 for “Spain: Europe Trip: 8/8/12–8/18/12.” Oklahoma State is also listed as a client on Promosport’s website, and while Ford declined to be interviewed, he said through a school spokesman that the Cowboys were introduced to Promosport while recruiting Soucek. Soucek did not, in the end, provide a solution for Oklahoma State’s frontcourt. While he stayed at the school for four seasons, he never cracked the playing rotation in a significant way, averaging just 0.9 points in 5.0 minutes. Three days later, on June 28, 2010, then-Valpo coach Homer Drew informed his players that they’d be taking a tour to Cancún, Mexico, in August. Valparaiso is exempt from public-records requests, but the school is listed as a basketball-tour client on Promosport’s website, and current coach, Bryce Drew, Homer’s youngest son, confirmed that the Crusaders used Promosport for the trip. On July 28, 2010, 11 days before Valpo’s departure for Cancún, Van Wijk was announced on the school’s website as a new team member. 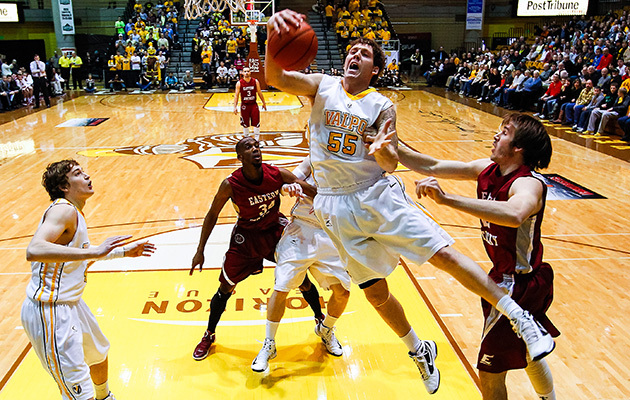 He went on to become the highest-impact CBA product ever in D-I, anchoring the frontcourt of back-to-back Horizon League regular-season championship teams in 2011–12 and ‘12–13. He was named first-team All-Horizon League in ‘11–12 after scoring 14.1 points per game, and that same season Bryce Drew, who recruited Van Wijk in Spain and was promoted from assistant following his father’s 2011 retirement, was named Horizon League Coach of the Year. On Aug. 4, 2014, Valparaiso announced the addition of yet another former CBA player, Shane Hammink, a 6'7" Dutch wing who spent two seasons at his dad’s alma mater, LSU, before transferring. "Hammink has become a starter for the Crusaders, who clinched another regular-season conference title in ‘15–16. Drew says that Valpo chose Promosport’s Cancún trip because his brother, Scott (the coach at Baylor), had taken the Bears on a similar Cancún trip through the same company in 2007 and recommended the experience. Two teams, in fact—Baylor and Arkansas—took identical foreign exhibition tours to Cancún on Labor Day weekend in 2007. And in the case of Arkansas, there was a pattern that would become familiar in later years. Pelphrey told SI he could not recall how the trip had been arranged. Orellana denies that he had ever directly been in the exhibition-tour business before setting up in Spain. “I never did any foreign-tour stuff,” he says. A request for records related to Arkansas’s Cancún tour did not yield a contract with Sosa Cruz’s Promosport & Tours, S.L., or any of its other iterations. What turned up was a contract from two months before the Patsatsia signing—dated June 15, 2007—that had the globe logo in its header that would appear in Promosport contracts years later, and used some of the same language, but was from a U.S. travel company. It was an agreement between Arkansas and World Wide Basket, Inc., of Laguna Niguel, Calif., for a 25-person tour to Mexico, at a cost of $62,375, and it was signed by two people: Arkansas athletic director Frank Broyles and World Wide Basket, Inc.’s president, Rob Orellana—who, later that year, would found the Canarias Basketball Academy. This story originally appears in the March 14, 2016, issue of Sports Illustrated.